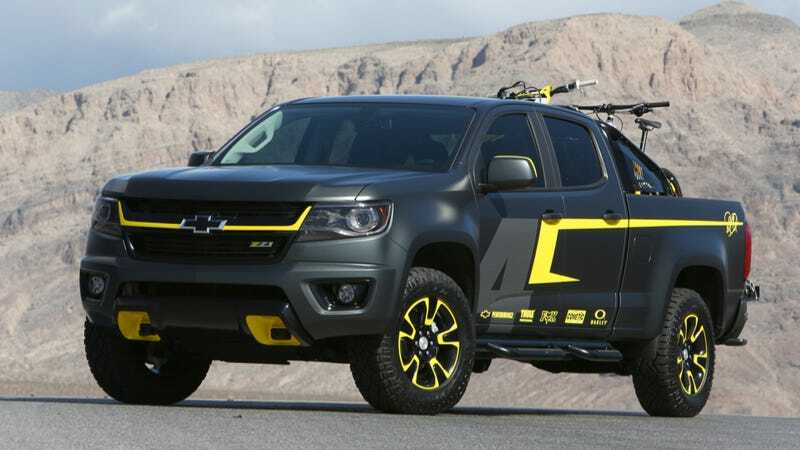 Here's the second "modified" 2015 Chevy Colorado as presented by GM. It's just like the first one; establishing that a roll bar, bikes, stickers, and removing the front spoiler rounds out Chevy's "how to quickly and cheaply make a Colorado look cool" list. If the spoiler must stay, can we at least get a quick-release? Here's GM's third Chevy Colorado SEMA concept, paired with a Nautique wakeboard boat. This one's not even meant to go off-road and hey look, the chin spoiler's been removed. GM's people maintain the front aero spoiler is good for "something like 1 MPG" on the highway. When I told that to Ford's folks at their F-150 hoe-down, they almost spit Budweiser through their noses laughing so hard. "I'd give my left arm for 1 MPG," an engineer told me, then basically elaborated that he thought the spoiler could part of a whole aerodynamic system that totals to a 1 MPG gain, but "based on our research no way is something like that worth that much." So, there you have it– from the two most biased sources who could possibly speak on the subject. Still waiting to hear back from some independent aerodynamic engineers to weigh in. The chin spoiler is secured by about 50 little bitty bolts. Unless you rig up your own connection system, you're not going to install-and-remove-and-install it more than once. So how many MPGs is this approach-angle killing chinstrap worth to you? How many people taking delivery on this truck will tear it off at the first opportunity– on purpose or by accident? Here's motocross champion Ricky Carmichael doing a jump over the "adventure-enabling" Chevy Colorado Performance Concept, which looks cool, thanks in large part to the removal of the truck's front aerodynamic bit. (You can see that on video right here). Images via Chevrolet, photo of the "stock" Colorado by the author. Want to seem more Chevy Colorado? Check out this mega-comparison across the "small truck" market, getting the first mud on its tires sneaking around the Mexican border, and Hooning its brother the GMC Canyon in the California desert.